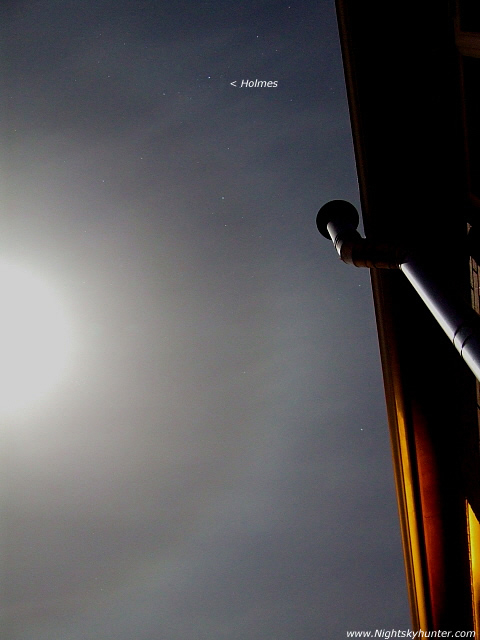 22 degree halo around the full Moon on Nov 24/25th 2007 at midnight. Facing above with my house rooftop to the right. Various colours can be seen within the halo with bright star Capella to the right. Above is Perseus with the faint fuzzy signature of 17P/ Holmes (marked). Sky was covered in cirrostratus. The field of my camera is too small to accommodate the full halo so I only got the western side. The east side faded rapidly. 15 second exposure at ISO400 at F/3.2. I took this image while chatting on the phone at the same time.